We are proud to announce that Windseal Double Glazing have joined the Refill Campaign to reduce plastic bottle use! As one of the first companies in Coventry to offer the free refill service, we invite you to call in and get your water bottle refilled anytime during opening hours. It was suggested to the company by one of it’s long term employees, Myles Byrne, that Windseal should get on board with the Refill campaign as a way to show how environmentally conscious we are. We are always looking for new ways to be more conscious, Windseal already send the old upvc window frames and glass away for recycling wherever possible.The Directors were very impressed with Myles’ suggestion, and his awareness of the environment. Single-use plastic bottles are expensive to produce, use up valuable natural resources to make and transport and create mountains and mountains of waste once we’ve gulped down the contents. And recycling’s not the answer either, here in the UK an estimated 800 plastic bottles a MINUTE are either ending up in landfill or as litter, which will too often make its way into our waterways and out to sea. By buying a reusable water bottle you will also save yourself a small fortune and they often pay for themselves within a week going on to save you money with every free Refill from then on! To find out where you can refill, wherever you are in the UK, get the app here http://www.refill.org.uk/get-the-refill-app/ You can collect points every time you fill up which can earn you a free water bottle! 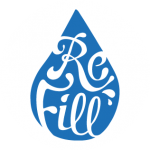 The Refill Campaign has only just reached Coventry, there are currently very few places you can fill up your water bottle for free, however we hope that many more local businesses will come on board very soon! It has already been very successful in Bristol and Brighton as well as a few other cities around the UK. Here in the UK an average of 35.8 million plastic bottles are used every day, but only 19.8m are recycled each day. This means an average of 16 million plastic bottles a day are not being recycled and are ending up in landfill or ending up in our waterways and seas. The latest Beachwatch survey (2016, MCSUK) found 159 plastic bottles for every mile of beach surveyed. It takes 162g of oil and seven litres of water to manufacture a single one litre disposable PET bottle, which amounts to the release of 100g of Carbon Dioxide (CO2), a major greenhouse gas. This means single use plastic bottles significantly contribute to pollution, even if they are subsequently recycled. Nearly two fifths (37%) of children in the UK mainly drink bottled rather than tap water in some parts of the country. Together we can change this! REFILL your water bottle!